This UG course enables the students to take up advanced studies with Microbiology (as one subject), Chemistry, Botany/or Zoology and help them find opportunities in M.Sc. in the respective disciplines. After the completion of degree programme , one can find a job in Government departments, Banks, biotechnology, microbiology based sectors etc.A student can also opt for higher studies in various state and central Universities. The term "biotechnology" is used in the application of molecular biology techniques to identify genes responsible for particular traits; to clone, study, characterize, and manipulate them; and finally, to insert them into different organisms. Q2. How are UG & PG Programmes designed? Choice Based credit system with continuous evaluation is followed in semester pattern. Q4. What is the Eligibilty & criteria for UG & PG courses? To apply it is mandatory to have taken Biology as a subject in your XII std. 45% aggregate marks in Physics, Chemistry & Biology is a necessary eligibility. Graduation in any discipline of science. Background in Biology is preferred for Biotechnology & Microbiology programs. Q5. Is there an entrance exam for UG Programmes? No, there is no entrance exam admissions are based on the basis of percentage of marks in intermediate with 45%. Q6. When did the admissions open? Q8. What is the eligibility criteria required for admission? For admission to Master’s programmes in Biotechnology, the minimum prescribed eligibility percentage is a minimum of 50% marks or an equivalent grade in the qualifying degree. Q9. Are hostel facilities available for all students? Hostels for girls who come from outside are available on a sharing basis (3-to-a room). Accommodation is not available for family members, spouses and children of married students. Q10. What is the teacher student ratio at SGRRU? Q11. Can I get campus jobs ? Q12. Does SGRRU offer online / distance learning programmes? No. All Master’s and Research programmes are regular programmes and do not allow students to take up full time or even part-time jobs. Q13. Is SGRR University affiliated to any University for purpose of recognition of degrees? No. Being a University, the question of affiliation to another university does not arise. Since the university is recognized by State Govt. 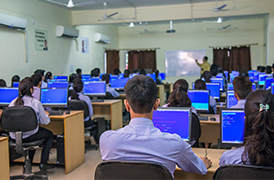 Uttarakhand of India, the courses offered by SGRR University are recognized. Q14. At the time of counseling, is the presence of candidate compulsory?